I once had a great conversation with a personal trainer/diet nutritionist (who at the time was working on public school food reform), and I remember at one point we were on the subject of cheeses, and he told me that the two best cheeses to eat were fresh mozzarella and ricotta. According to him, these cheeses are great for us because they are the only ones our bodies can fully process and digest. Most other cheeses (while exceptionally delicious) are higher in fats, oils, and/or include indigestible by-product(s) from the milk-to-cheese processes. Needless to say, I have been inspired since to eat more ricotta. When it comes to pasta, this cheese usually plays a supporting role (ie: in lasagna, or as a filling for ravioli), but ricotta does wonders when made into a sauce. Its creamy and mild richness belies the fact that it is low in fat and incredibly healthy for you. 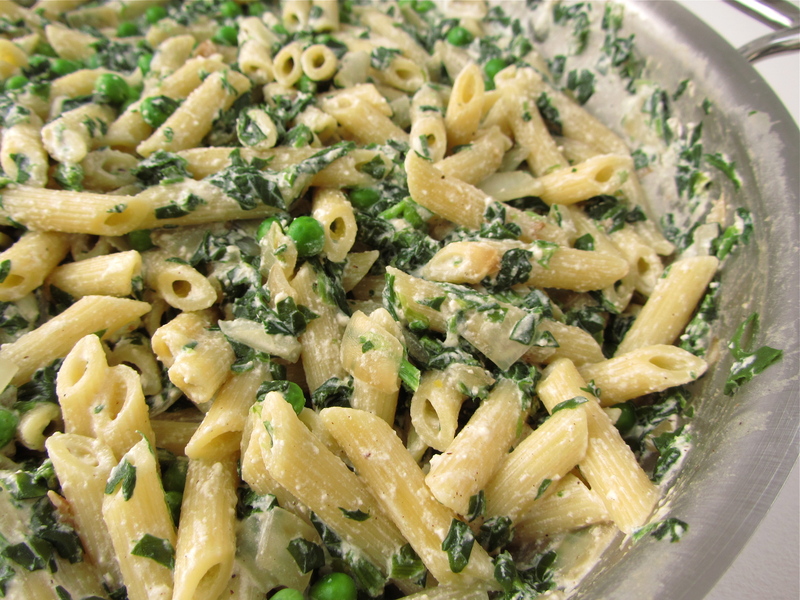 This pasta comes together very easily in my house, since I always have frozen spinach and peas in the freezer. Enjoy! 1. Cook the pasta in a large pot of salted water until “al dente,” about 9-10 minutes. It should be firm to the bite, but not hard. 2. While the pasta is cooking, prepare the sauce. In a bowl, whisk together the ricotta cheese, salt, pepper, and nutmeg until well combined; set aside. In a large skillet over medium heat, heat 1 tablespoon of olive oil and cook the onions until they are soft and translucent, about 5 minutes. Add in the spinach and peas, cook until peas are heated through and are bright green. 3. Reserve 1/3 cup of the cooking water, then drain the pasta, and add to the skillet with the spinach and peas. Reduce heat to low, stir in the ricotta cheese mixture and reserved cooking water. Toss well to combine. Serve immediately. * Be sure to thaw the spinach ahead of time. Or, it can be thawed in the microwave for a few minutes on a medium setting. * Reserve extra cooking water if needed to thin out the sauce. The sauce thickens after it cools, so if you need to reheat the pasta, add more water to loosen it back up.